Italy was recently reminded that the entire spine of the country is one long fault line, subject to major earthquakes at any time. But it was still surprising that the area north of Bologna was hit so hard. The last major quake in the area occurred in the 14th century. 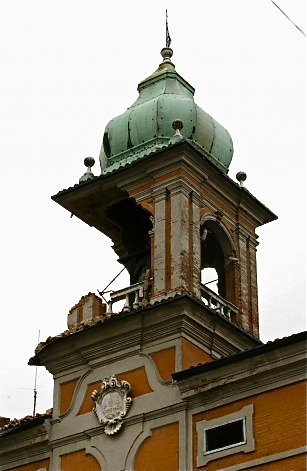 The earthquake that struck northern Italy in the early hours of Sunday morning killed seven people and injured scores of others (mostly those on the night shift) and left scenes of heart-breaking devastation of historic buildings. Even a week later, aftershocks were disrupting the cleanup efforts. But one of the greatest economic effects is the damage that will affect production and export of some of the area’s most internationally famous cheeses – Parmigiano Reggiano and its rival, Grana Padano. 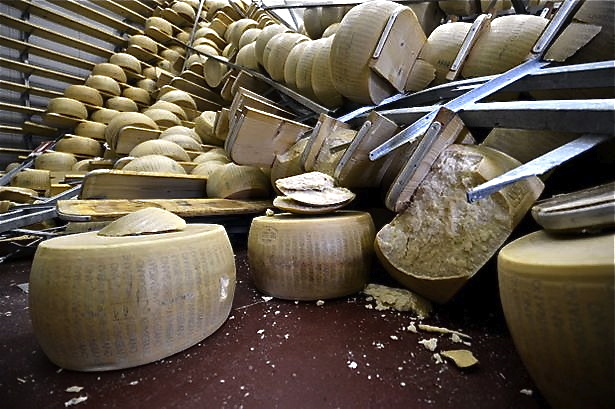 Approximately 300,000 wheels of Parmigiano Reggiano and 100,000 of Grana Padano, each weighing about 40 kg (88 pounds), were damaged when they fell off shelves in warehouses where they were undergoing the two to five year-long seasoning process. Those who have seen the dawn to dusk process that creates the raw form of the long-seasoned cheeses can appreciate the heartache caused by the destruction of the aging wheels of Parmesan and Grana. This video gives a good review of the process from cow to table. 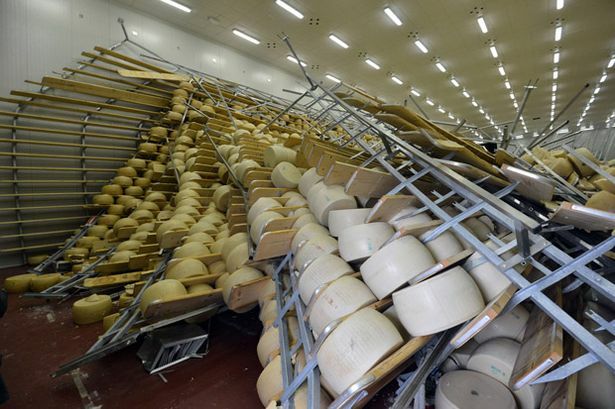 Estimates conclude that ten percent of the production of Parmigiano Reggiano and two percent of Grana Padano was affected by the quake. At a retail price of up to 25 euros a kg ($15.00 a pound) in Italy and (much) more abroad, Parmigiano Reggiano is one of Italy’s most expensive cheeses. 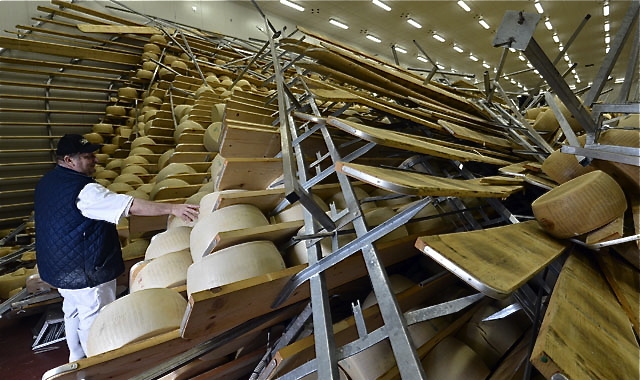 The area produces 3.3 million wheels of Parmigiano Reggiano a year. The 6.0 earthquake caused the heavy wheels to collapse seven-meter (23 feet)-high shelves. They piled like dominos or a set of overturned bookshelves. Production of milk used for cheese making in the area was also affected because many cows died in the collapse of stables or were left traumatized by the quake and its aftershocks, affecting the output and quality of milk. 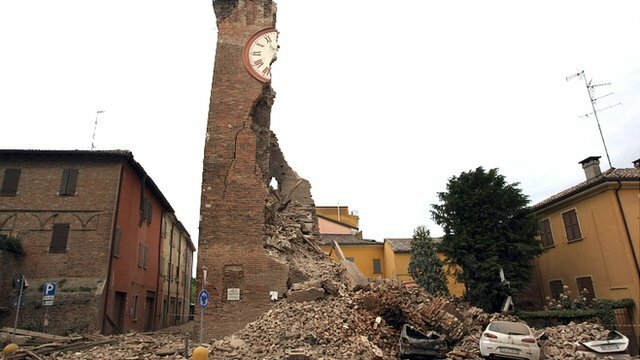 Production of the Emilia-Romagna region’s famed Prosciutto di Parma (seasoned Parma ham) was not seriously affected by the quake, an official of the Prosciutto di Parma consortium said. While some pig farmers in the quake area saw their herds killed or injured, most of the pigs come from other parts of northern Italy and only the production process itself takes place in the Parma area, which was not hit.